Fort Campbell, KY – The U.S. Department of Defense announces today the death of a Soldier who was supporting Operation Inherent Resolve. 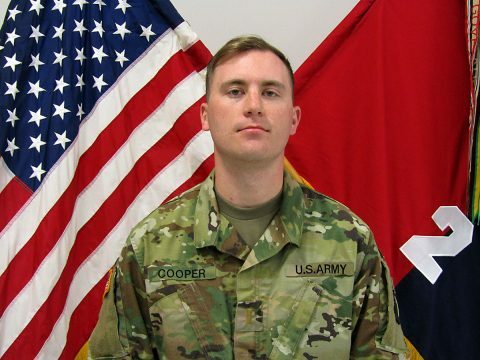 1st Lt. Jeffrey D. Cooper, of Mill Creek, Washington, died September 10th, in Kuwait, from a non-combat related incident. He was killed as a result of a vehicle rollover accident while traveling from Camp Buehring, Kuwait, to Ali Al Salem Airfield. Cooper, 25, was an infantry officer assigned to Headquarters and Headquarters Company, 2nd Battalion, 502nd Infantry Regiment, 2nd Brigade Combat Team, 101st Airborne Division (Air Assault). He joined the Army in June, 2013, and arrived at Fort Campbell in July, 2015. His awards and decorations include the National Defense Service Medal, Global War on Terrorism Service Medal and the Army Service Ribbon.